Tasting oil-packed sun dried tomatoes for the first time, I fell deeply in love. Chris Cantelmi brought me some from one of his adventurous trips. He was known for introducing me to delectables like this, not to be found anywhere locally. Times have changed and you can purchase these tomatoes in most large groceries. Back then, almost three decades ago, sun dried tomatoes in any form were almost unknown in this neck of the woods. That same summer, Tony Mendez gifted us with two lugs of ripe Romas, perfect for drying. Now we just needed to know the process for this amazing oil concoction. In the middle of all the drying and canning projects I got a call from a panic-stricken older woman who needed a ride to her doctor. How can you say “No!”, even when it meant tying up a whole day? As I sat in the doctor’s waiting room waiting for Helen, I stumbled on a tiny article in the back of a food magazine: How to Pack Dried Tomatoes in Oil. I nearly went through the office ceiling in delight and then read the article 3 or 4 times. The concept is just so quick and simple. How could anything that easy be so delicious? Within a half hour of arriving home, I had a large jar of sun-dried tomatoes packed in oil. There were enough oil-packed tomatoes for me to eat all I wanted with no concern of running out. And guess what? The home-made version out-classes the store-bought version any day! Just about any home-grown vine-ripened tomato will give you tasty results. However, for the most intense tomato flavors go with the paste-type tomatoes. Roma falls in this category as do Amish Paste and San Marzano. There are a number of varieties of paste tomatoes available if you want to start the plants from seed. This season I am loving the Amish Paste for drying. They are dark, dark red and densely flavored. Sun drying is not essential to the process. You can dry your tomatoes in a dehydrator or even in your oven if it has a pilot light. No garden? No problem! You can order dried tomato chips from Just Tomatoes (here). I love those folks! 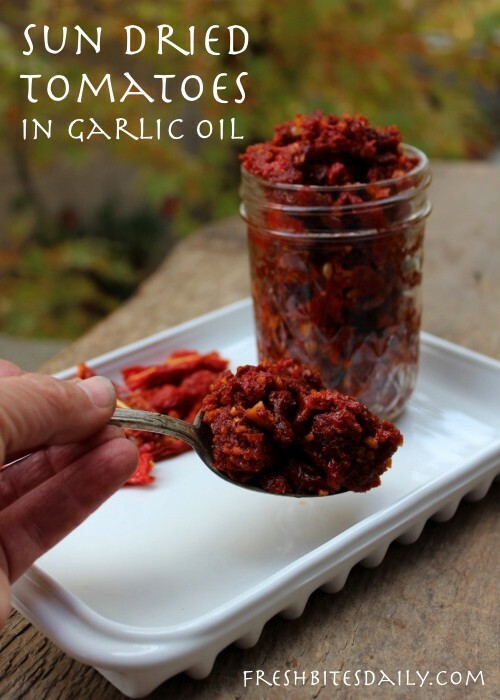 Measure out enough dried tomatoes to last you a couple of months. They will last longer than that under refrigeration, but I think they get a bit tired. 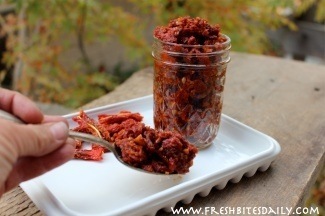 Put the dried tomatoes in the freezer for several hours or over night. Use a strong freezer bag for this. When the tomatoes have frozen, they are as brittle as glass for a minute or so. Lay the bag of frozen tomatoes on a solid surface. Go over it gently with a rolling pin. Turn the bag over and repeat the process on the other side. Hold a large strainer over a plate and dump the contents of the bag into the strainer. Shake the strainer to knock out the tomato powder. Catch the powder on the plate. Save the powder for other projects. Dip the tomato-filled strainer into a pot of boiling water a couple of times and then drain the tomatoes thoroughly. One way to do this is to set the strainer over a bowl for about 15 minutes. While the tomatoes drain, sauté crushed garlic in extra virgin olive oil. The amount of garlic will depend on the amount of tomato and on how much you love garlic. Use only enough oil to sauté the garlic. You will be using more oil for this project but keep it unheated. Dump the tomatoes into a bowl. Add the garlic and oil. Gently toss to evenly distribute the garlic through the tomatoes. Add a sprinkle of sea salt if you like. Pack the tomatoes into a glass jar that has a tight-fitting lid. Press the tomatoes down as best you can. A spatula or wooden spoon works well for this. Pour olive oil into the jar until the tomatoes are completely covered. Check in five minutes. You may need to add more oil as the oil slowly seeps into air spaces among the tomato pieces. Put the lid in place and refrigerate the tomatoes. The oil will solidify with refrigeration so plan to scoop out the amount of tomatoes you will need 30 minutes or more before using them. The oil will warm up and become liquid again. When you run out of oil-packed tomatoes, just repeat the process. 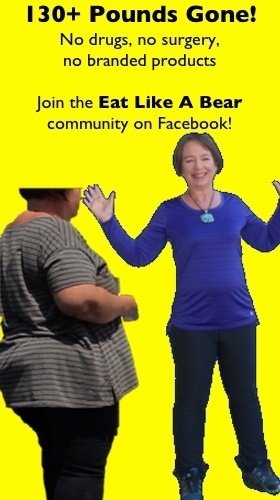 It is quick and easy with stunning results.